My sister approached my brother and I about surprising my mother for her 60th birthday. Getting the three of us on the same page for a date and time for the surprise was actually easy considering it had never happened before. I can’t remember the time my siblings and I were in one place without significant others and children. My gorgeous sister and I hopped on a plane from Phoenix, Arizona to Sacramento, California and got picked up by my little brother. The flight and the car ride were almost surreal. In fact the entire trip was an exercise in working out old demons from our past, albeit from three different points of view. Truly amazing to see how God has worked in my siblings lives in the face of tough circumstances and upbringing. I will always remember our car ride back to Redding, California. I don’t think I understood how much joy the surprise would bring our mother. To be frank, I had to set my anxieties aside about returning to Northern California. I normally have nothing to do with returning to “the past” but this trip ended up not only being for my mother but for all of us too. The next day we took a trek back to our roots. A place you might have heard me mention before. My mother and her family had camped in the are of Mt. Lassen for many years. She passed the love of this place on to us. Mount Lassen is a beautiful place with a beautiful horizon and many trees! I believe this was where the seed was planted for my love of the out doors. Barney Falls is an area we camped in numerous times growing up. The falls are just amazing and breathtaking. So we had decided to take our mother back to this spot. A spot we spent many summers, Labor Day and Memorial Day vacations. The falls are roughly 130 feet high and have a constant flow of 380 million liters everyday! Burney Creek is tributary of the Pit River and dumps into the Lake Britton Reservoir. I can remember watching my uncles fish on the upper portion of the creek and wondering if they’d survive if they fell in! Standing below the falls brought a few tears, to my eyes, both for great memories and just God’s artistry on this canvass we call Earth. Unfortunately, our little gem in the Lassen area has become a HUGE “citified” attraction and is way over crowded. The once rural camp grounds are now so packed with tourists it was almost appalling. The little store my siblings and I would go buy candy and ice cream was now closed and a monster “store” has taken its place. Even with all the people and changed environment I truly enjoyed my time just basking in the glory of the old falls. The cool air generated at the bottom of the falls was amazing. I wish I could have bottled it to take back with me to the furnace (Arizona). The best part about it was seeing the joy it brought my mother. I think having her three children alone in a place where she tried so hard to give us good memories and experiences was a perfect cap to her surprise. 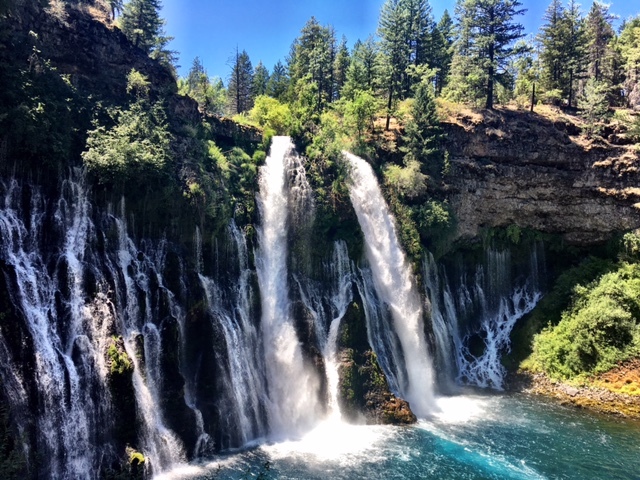 Burney Falls will always hold a special place in my heart. Returning home was good for all of us. I have my sights set on returning and exploring Lassen and Mt. Shasta very soon! Explore your world! Keep your circle small! Love those who love you unconditionally! Mother, thank you for sparking our adventurous spirit! You are very dear to all of us! Happy Birthday and we love you! Really glad you all had an awesome time and your mum was well happy and surprised. I just love your mom’s reaction to seeing you guys there. I’m glad you were able to do this for her. An amazing moment she will remember forever.